Meets at 10 am or 7:30 pm. 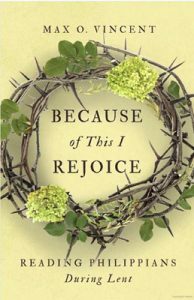 "Because of This I Rejoice" is a 6-week study of Philippians that explores what Paul teaches about joyfully practicing spiritual disciplines. This Lenten study invites us grow closer to God and allow joy to flow through our lives.